Project consists of a 32,838 sf addition to the historic Bright house and limited renovation of the existing Alumni/Bright House. The addition will be three stories high, concrete foundation, brick veneer on load bearing masonry walls with steel framing, EPDM/slate shingles roof and aluminum windows. 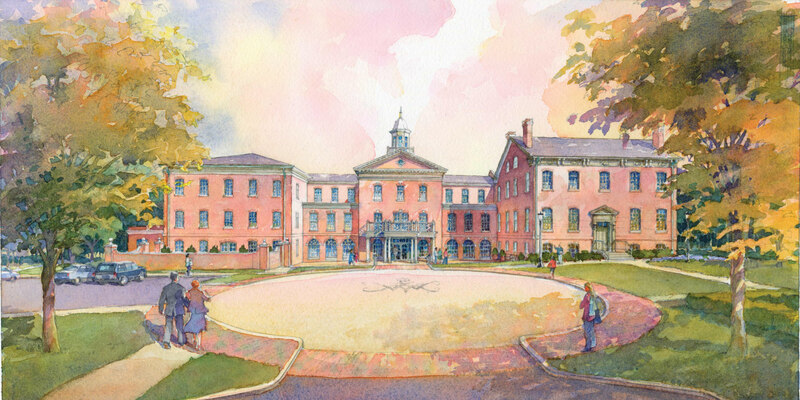 Alterations will include a two hour fire wall where the new addition abuts existing Alumni House, one-for-one replacement of the HVAC systems at the Alumni House, windows replacement only in the Bright House as well as plaster repairs associated with the HVAC systems and windows replacement. Exterior site work includes drop-off circle and associated road and parking, plaza, garden, terrace, landscaping and onsite parking.